SKOWHEGAN -- It took a little while, but once the Messalonskee High School baseball team's offense found its groove at Skowhegan on Monday afternoon, it never lost the beat. SKOWHEGAN — It took a little while, but once the Messalonskee High School baseball team’s offense found its groove at Skowhegan on Monday afternoon, it never lost the beat. The Eagles pounded out 13 hits, eight over the final three innings, to take an 11-3 Kennebec Valley Athletic Conference Class A win. This game was scoreless for four innings before Messalonskee (8-3) finally figured out Skowhegan starting pitcher Kam Nelson in the fifth, when the Eagles scored three runs. Jared Cunningham singled to start the fifth for Messalonskee. After Trevor Gettig’s sacrifice bunt moved Cunningham to second base, Skowhegan intentionally walked Dexter. Deven Warren followed with a single to score a run and Zach Mathieu singled to drive in two more. “We tried to get the players to adjust and stay back and go the opposite way and I think a couple of them actually started to do it. 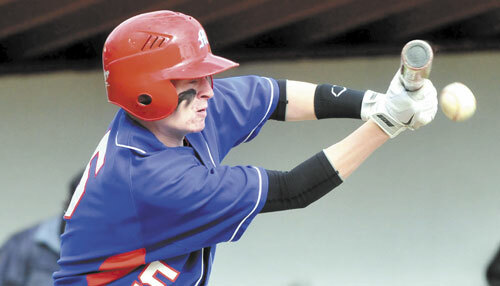 The players caught on and, once the hitting started, it’s contagious,” Messalonskee coach Ray Bernier said. The Eagles added six runs, five unearned, in the sixth inning and Ben Frazee doubled in the seventh to score two more Messalonskee runs. For Skowhegan (5-6), it was the fourth and final game played without a full roster. Eleven Indians were suspended four games for violating the school’s athletic code. The Indians lost all four games and York said his team was exhausted. “The nine guys we have are out of gas. We’re going to rejuvenate (Tuesday) and we’re going to keep battling,” York said. Warren cruised through the first four innings for Messalonskee, allowing one hit and striking out six before he ran into a little fatigue in the later innings. Warren threw a complete game, surrendering seven hits and three walks while striking out seven in his first start since losing to Hampden last week. “(Warren) was really in a groove. He needed a bounce back start and he got it,” Dexter said. Warren had a pair of hits and scored three runs. Frazee had three hits and drove in a pair, while Cunningham scored twice. Trey Michonski drove in a run and struck out four in 1 1/3 innings of relief for Skowhegan. Cam Despres had his first varsity hit for Skowhegan and scored a run.